Sometimes an F-104 Starfighter is found without any markings or identifications. 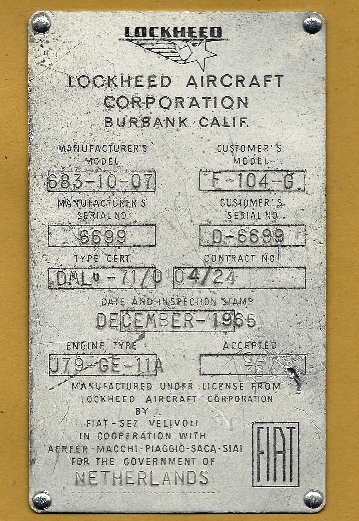 This could be as scrap or even as preserved aircraft wearing a fake serial. 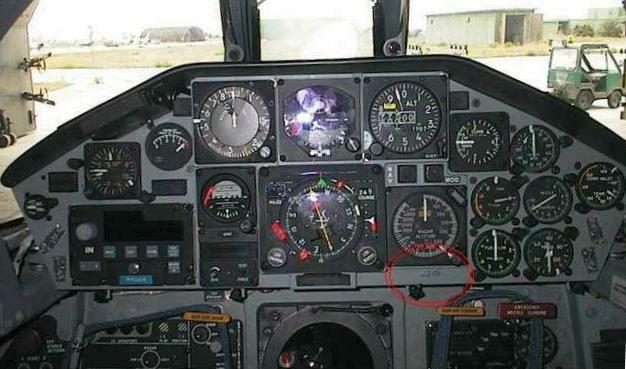 To find out the real identity of the aircraft is very hard in most cases. 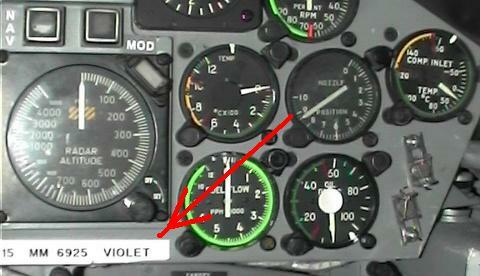 Most successful will be a intensive investigation inside the airframe, looking for construction number plates. However be carefull. Lots of number plates are just plates of specific parts (these always show "Part Number" on it and the identity number doesn't say anything'). 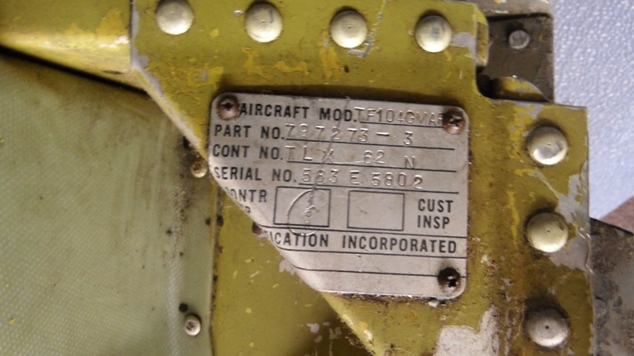 The best way to identify the aircraft is to check for original construction number plates inside the aircraft. 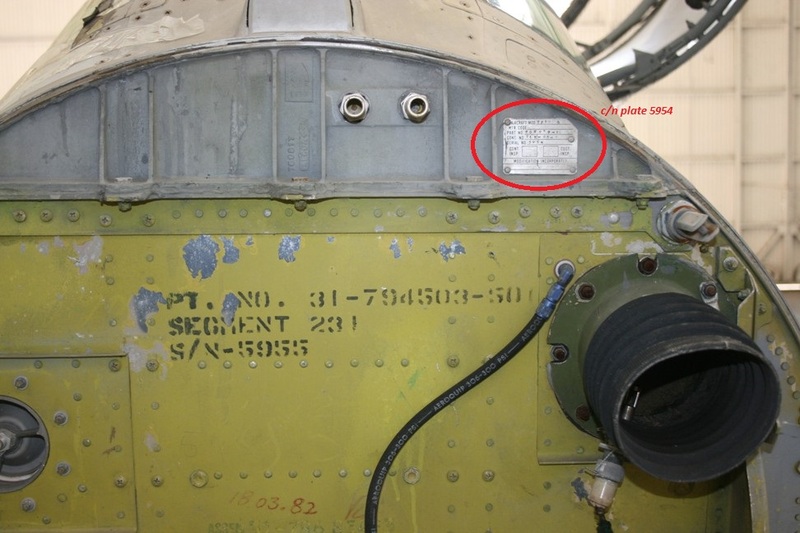 Regarding the real aircraft’s data plate: there are only 2 real plates in the aircraft !!!! More about these real plates but also the other plates which can only be used as rough indication can be found in the chapters beneath. 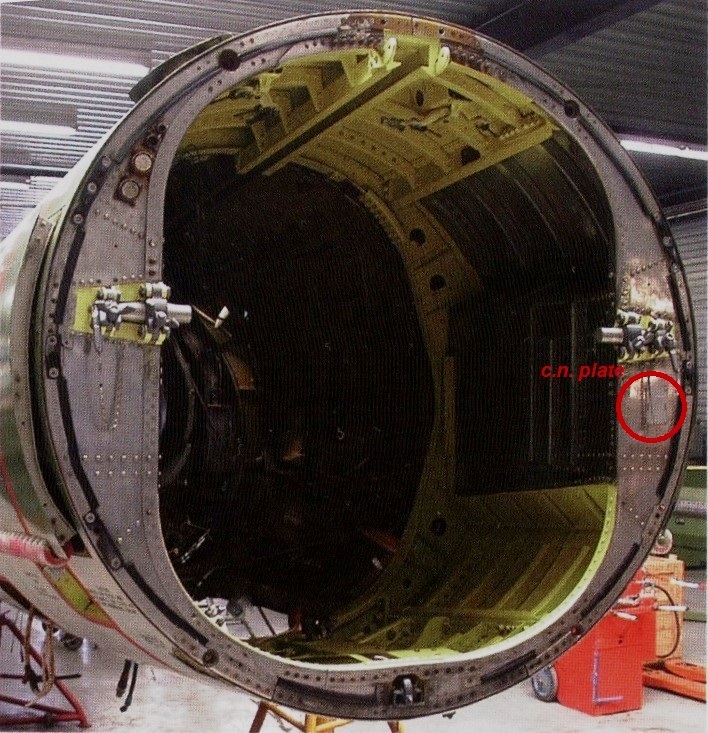 F-104G 6699 (ex Dutch Air Force D-6699) plate could be found at the unique cockpit location. The second location where a real aircraft’s data plate can be found is hard to locate. You will find it in the RH side of the rear fuselage frame where fuselage splits and under the engine RH attachment point, see photos beneath. 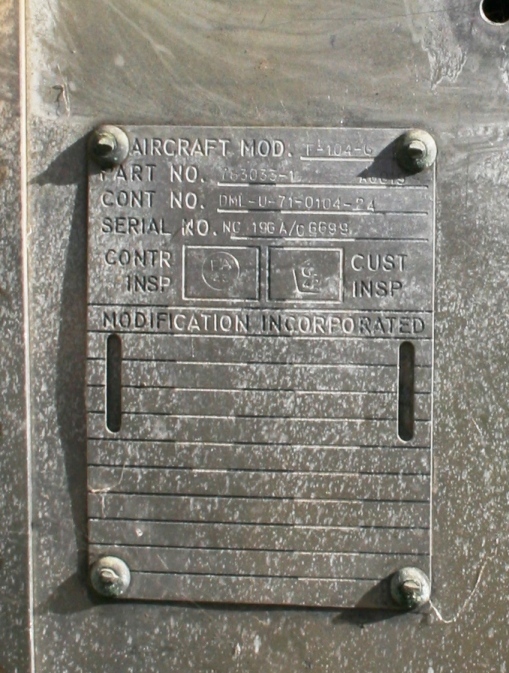 An identification area is also the nose-mount windshield plate on which also the radar is attached. It is visible when removing the nose-cone of the F-104 Starfighter. Beneath an example of an Italian TF-104G which shows the plate on the nose-radome plate. 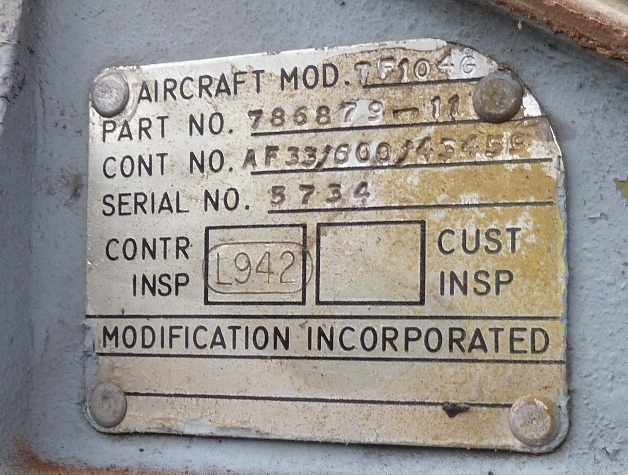 Regarding the front data plates of some of the Canadair single seaters, which have been found incorrect being out by one digit, this is in fact all right as this not the aircraft’s data plate but the windshield data plate!! For some reason the wind shield s/ns consist of two Nos. the Model No. (683D for F and 583C for TF like it happens with the C2 Ejection Seat s/ns) and the item s/n which normally follow the sequence of aircrafts c/n, within the Lockheed, Canadair, Messerschmitt, and maybe MBB, Fokker and SABCA production lines, except that of Fiat who use a different system e.g. 345-2220-A0170 (F-104G 6699 see photo beneath). So it seems that because of an item failure during production (a failing windshield, that is our guess) or for some other reason unknown to us, the sequence went out by one digit, though there is even an example that it was one digit plus (TF-104G 5733 see photos beneath, in this case may be a fuselage rejection) as well another one that the sequence was even (F-104G 64-17782 c/n 6127, see photos beneath, which means things work out well). 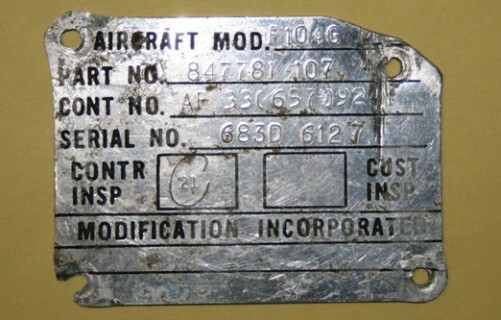 Windshield plate of aircraft 5733. 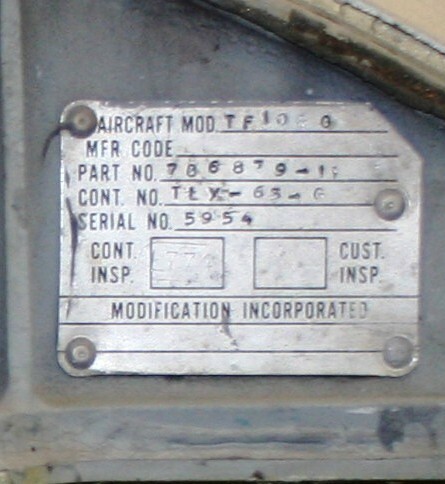 TF-104G 5955 (as printed on the frontshield) carries a windshield construction number plate with nr 5954..
Aircraft 64-17782 had a windshield plate with number 683D-6127 which perfectly matches its construction number. 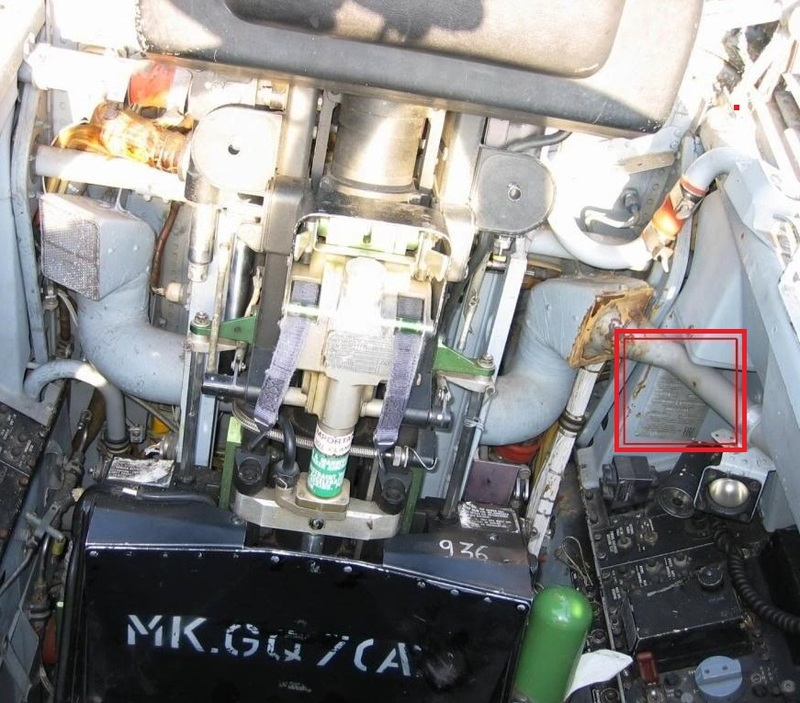 See also the attached photo of TF-104G 5955 a bit above, its upper dark gray part is the windshield frame front lower attaching part compare with the figure on PDF, and the green lower section is the front bulkhead STA184 on which is painted the a/c’s c/n (on most cases). 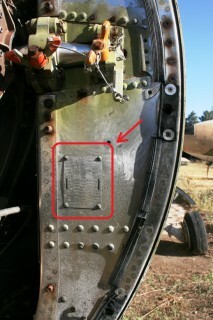 An interesting location to find a c.n plate is inside the dragchute holder. 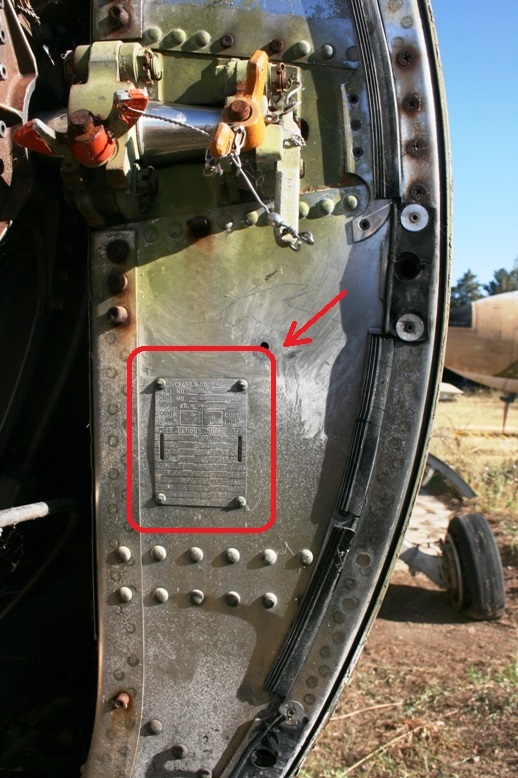 Beneath an example where the plate can be seen of the TF-104G D-5802 with c/n 5802 clearly seen. A lot of ex Italian F-104A/ASA-M Starfighters have been put on display on various locations in Italy the last years and most of them have no MM serial or other identification painted on the fuselage. 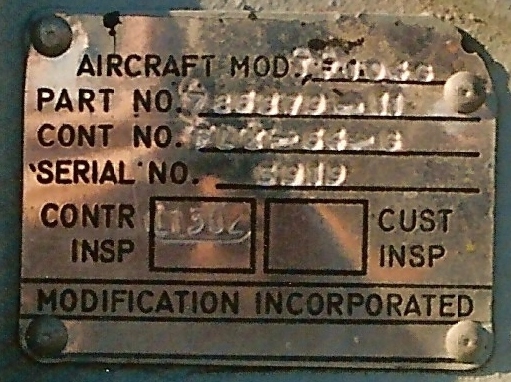 On the aircraft most of the times a copper plate is mounted to declare that the aircraft has been treated according CFE agreements. 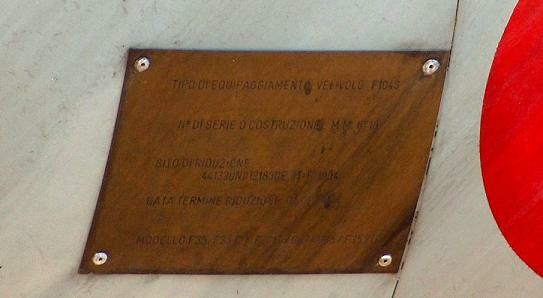 Here the plate is seen of MM6719 thanks to Paolo Maglio. 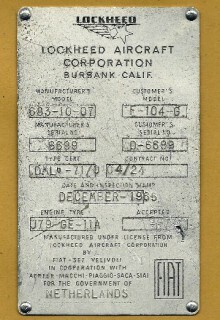 IFS: BE AWARE THAT THE PLATES DO NOT ALWAYS REPRESENT THE ACTUAL AIRCRAFT IDENTITY. SOMETHIMES PLATES ARE REMOVED FROM CFE TREATED (bad condition) AIRCRAFT AND MOUNTED ON NEW PRESERVED STARFIGHERS BEFORE DELIVERY. Inside the cockpit the squadron used the squadron code digits or MM serials which were applied beneath the radar-altimeter of the S-ASA and S-ASAM as well as the TF-104G-M aircraft.At Grazzanise the 10 Gruppo always applied the code by handwriting, the 18 Gruppo (37 Stormo) used stickers. Above two examples. 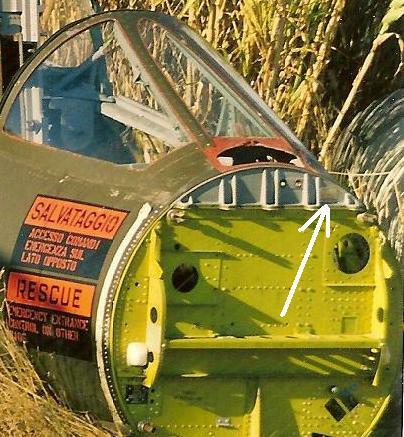 On top the cockpit of F-104S/ASA-M with code ""46" which means that this aircraft had serial "9-46". The other photo shows the MM6925 as sticker applied beneath the radar altimeter. 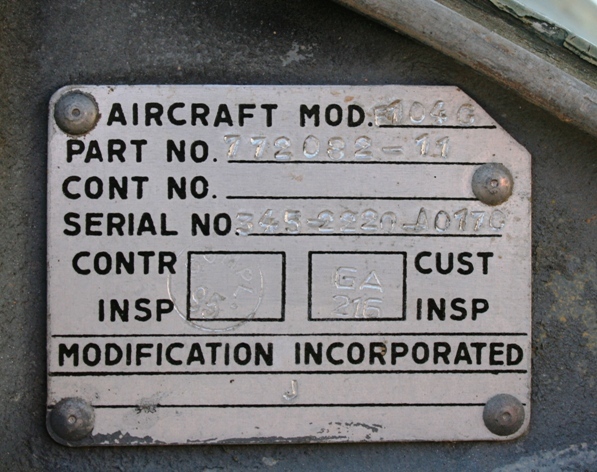 When an aircraft is preserved this code could tell more about the identity since it shows it latest operational code. Finally we mention the plates in the wheel bays... It is possible to check for construction number plates in this location. These can be found high up inside the front wheel bay as well as inside the main wheel bays. 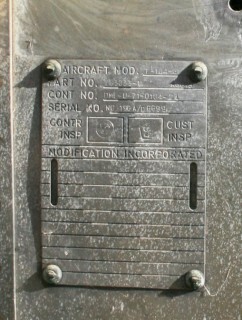 Also on the nose-wheel doors plates can be found. But be aware that most of the time these link to a wrong aircraft since nose wheel doors were switched frequently.